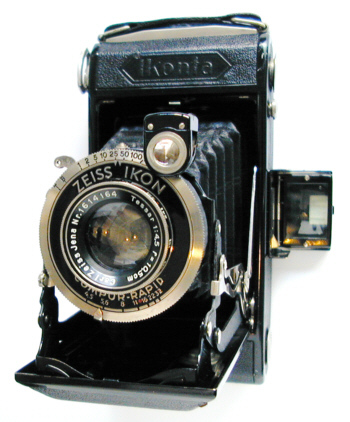 This was the second Zeiss Ikon camera that I bought when I got back into photography. Edit: I forgot to mention this is an Ikonta C 520/2 with an f/4.5 105mm Tessar in a Compur shutter. The camera was made in 1937. I almost always have used the flip-up viewfinder rather than the tiny brilliant finder. I think that I bought it from a woman in Nova Scotia in early 2001 - in the midst of the "go digital" craze when people were dumping film cameras like they were the plague. It was a bit grimy but otherwise in good condition. The viewfinder was hazy, so I separated the lens elements by heating the viewfinder elements in water on the stove - what the hell was I thinking? It worked, and now I have a clear viewfinder. The Tessar on this camera is outstanding. 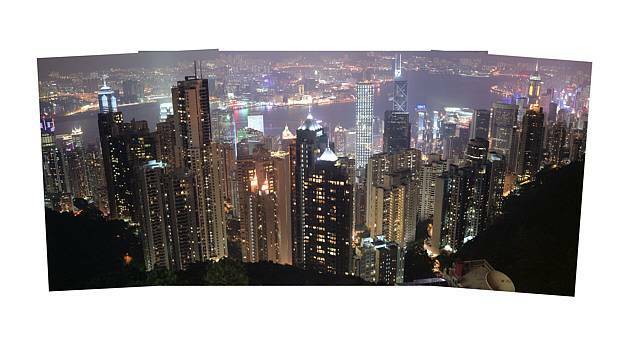 I was working overseas at the time, and my family and I were visiting Hong Kong's Peak - the highest point on the island. The viewing platform was crowded (every place in Hong Kong is always crowded) but even so, I managed to take three shots. I was shooting Fuji Reala at f/8, and I couldn't see my watch so I counted to 16. I took three shots at different locations on the platform. When I got the film back, it occurred to me that I should stitch them together into one shot. I scanned each into a high-resolution 1600 dpi image and then stitched them together. It took about 45 minutes to clean up the scans and do the work. It was on an old Pentium-class PC on Windows 98. Most of the time involved waiting for the screen to redraw. Because I took the three shots without thinking that I might want to combine them, I had to slightly rotate the outer shots. Afterward I cropped to a panoramic shot. The original is nearly 8,000 pixels wide, and the TIFF is about 144MB. Clicking on the photo displays it in a new window (or should). I'll post some more regular photos from this camera. Last edited by melek on Sat Jul 05, 2014 2:16 pm, edited 4 times in total. Excellent job on the stitching, Mike, though the Imagizer doesn't seem to be working. I hope to one day get mine back together, now that I have proper tools to get the shutter assembly off so I can do some work on the struts. Beautiful shot(s), Mike. Quite impressive looking at the full size shot. It's something else to think of that lil ol' camera from 1937 capturing such a modern city as Hong Kong and doing it so well. Feels anachronistic somehow. Very impressive panoramic, let alone the camera used. A Tessar in 6x9 size, wow. Nice. A great blend of old and new technologies combining. I've stitched a few shots from film in the past. It's certainly much easier with the current software options than it was even a few years ago. Yes, very impressive panorama indeed - well worth the time you spent on it. And a lovely camera it is.